College of Veterinary Medicine microsurgery training laboratory with Dr. Heidi Phillips. Students enrolled in microsurgical training courses receive one-on-one training in surgery and microsurgery, including intensive instruction on the proper use of an operating microscope and surgical loupes, micro-instruments, micro-suture, and live animal models (rats). 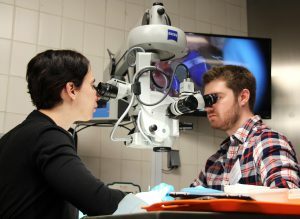 The benefits of courses provided by the University of Illinois Microsurgery Research and Training Laboratory are the development of basic and advanced surgical techniques and techniques in microvascular and microsurgery, and to enhance clinical and research outcomes and animal care by ensuring best practices in many companion animal and laboratory animal surgical procedures. The microvascular course runs Monday-Friday from about 8:45 in the morning to 4 or 5 pm daily. Breakfast, lunch, and snack breaks are included in the cost as practicing microsurgery can be draining and taking breaks to avoid frustration and fatigue is recommended! A textbook is also provided. Veterinary short courses run over 3 days from about 8:45 in the morning to 4 or 5 pm daily. Breakfast, lunch, and snack breaks are also included. We first teach the use of the operating microscope and use of microsurgical instruments and suture (8-0 to 10-0) as well as microsurgical techniques on inanimate and validated models before moving on to operate on cadavers or anesthetized laboratory animals. Microvascular surgeries in laboratory rats involve dissection in the medial thigh to the femoral artery and vein and epigastric artery and vein. Vascular transection and anastomosis with the aid of vascular clamps is taught, and end-to-end as well as end-to-side anastomoses are performed. If a student does well, the opportunity to perform free tissue transfer of a groin flap from one thigh to another is taught. Additionally, nerve anastomosis using the sciatic nerve is available for practice. Finally, opportunities for developing research models or practicing other surgical techniques such as those focused on the reproductive or urinary tracts, lymphatic system or nervous system are available and can be tailored to each student’s interests. 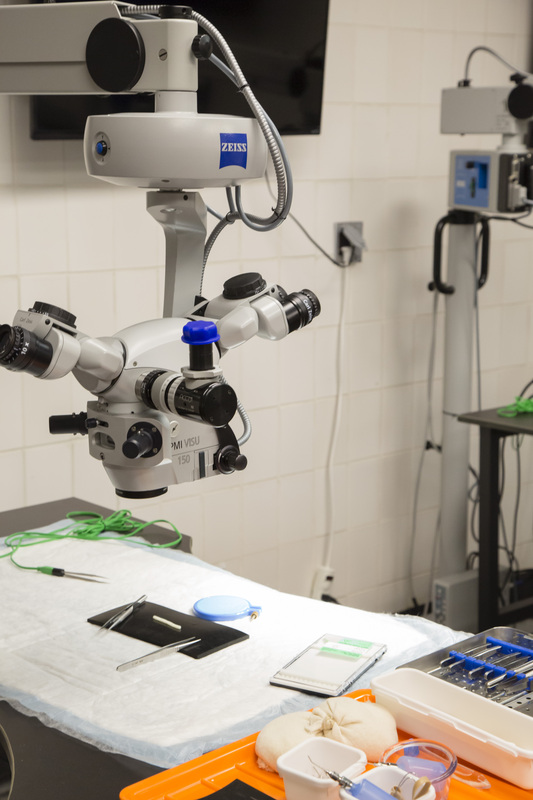 Veterinary short courses focus on ureteral microsurgery of dogs and cats, and involve practice on a validated model of ureterolithiasis, as well as practice on ex vivo ureteral tissue from small animals, feline cadavers, and anesthetized laboratory animals. Ureterotomy, ureteral reimplantation, and ureteral resection and anastomosis are taught with the aid of surgical loupes and an operating microscope. Opportunities for practicing adjunct procedures such as nephrostomy and cystotomy tube placement or suturing over a stent are available, and help to provide context for the application of interventional procedures. Students also gain experience developing a comprehensive approach to ureteral diseases and deciding the most appropriate treatment for each individual dog or cat. Regardless of the type of surgery you practice as a veterinarian, physician, or animal researcher, practicing the techniques taught in this course will greatly improve your tissue handling and chances for clinical surgical or research success. 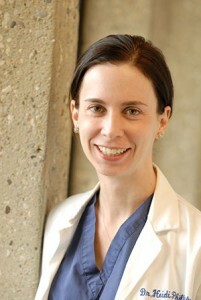 With surgical skills honed performing ureteral surgery, vascular surgery, and feline and canine kidney transplantation as assistant director of the Renal Transplant Program at the University of Pennsylvania School of Veterinary Medicine, Heidi Phillips VMD, DACVS now offers microsurgical training at the University of Illinois College of Veterinary Medicine. Her expertise includes microvascular surgery, reconstructive surgery, and urogenital surgery, especially feline and canine ureteral surgery and transplant surgery. Dr. Phillips has also developed rodent surgical models of disease with researchers in a variety of fields of study. Board certified by the American College of Veterinary Surgeons, Dr. Phillips is an award-winning teacher who has trained medical students and fellows and has directed the Small Animal Surgery residency programs at the University of Pennsylvania, Philadelphia and the University of Illinois, Urbana. Dr. Phillips has trained with experts in microsurgical instruction from the Cleveland Clinic and Columbia University using the rodent model. Recently, she has developed and validated a latex model of ureteral obstruction for use in microsurgical training.